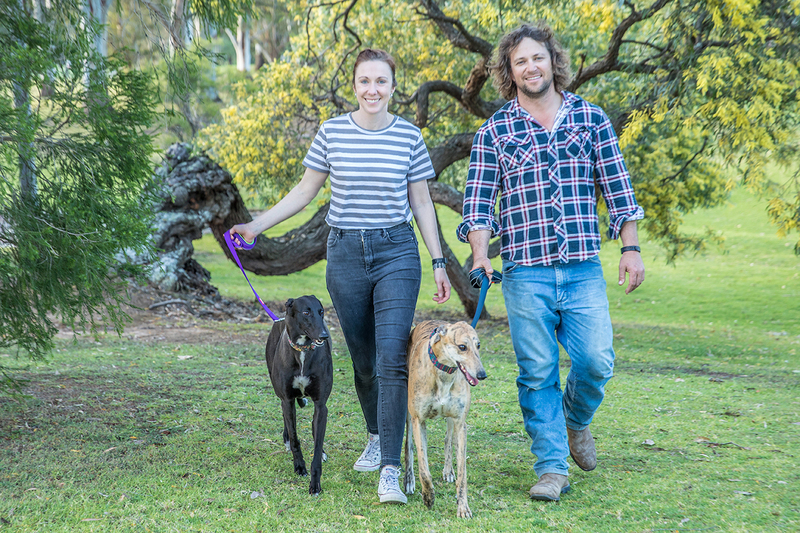 Many people have some down-time over the Christmas / New Year break which provides the chance to foster a Greyhound and see if it’s a good match for your lifestyle. What does this involve? Sydneysiders Luke and Brooke share their first hand experience. 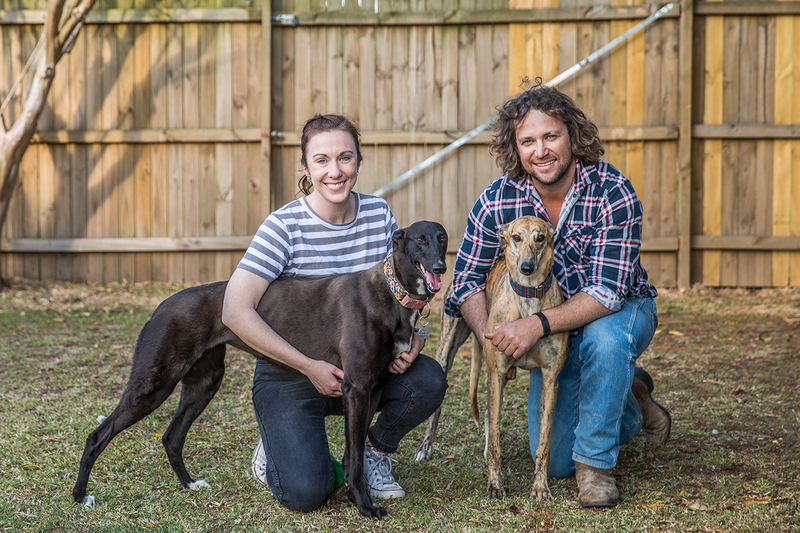 The couple’s foster Greyhounds, Lauren and Jarrah, a bonded pair aged 2.5 years, came from Greyhound Rescue, a Sydney charity.“Fostering has been a great experience. The girls are always making us laugh,” said Luke. Rescue Greyhounds usually need some time to adjust to home life because they have generally spent their lives in kennels. Brooke said one of the first things was to teach the girls not to jump on the kitchen island.“A firm ‘no’, just once or twice and the girls knew that the kitchen bench top was out of bounds,” said Brooke. She and Luke have enjoyed introducing their Greyhound girls to the neighbourhood. “It's clear the girls get so much enjoyment out of their walks – their ears are at attention, there’s a sense of excitement in their steps and their tails are wagging,” said Brooke. “We've enjoyed introducing them to people passing by, especially the ones who stop to say hello and give them a pat.” Brooke said the dogs are still getting familiar with the simple freedom of being out in the open and having an opportunity to explore. Meanwhile, routine has helped the girls adjust to home life amazingly well. “It’s provided them with a sense of stability and, subsequently, reassurance. It's also helped build their confidence and general trust in us and in their surrounds,” said Brooke. Greyhound Jarrah is nervous about some floor surfaces, like the vinyl surface in the kitchen. “Fortunately, she’s a quick learner and has learnt to approach smoother surfaces with caution, rather than speed,” said Brooke. ‘Zoomie’ is a common word used by Greyhound lovers to describe the brief spurts of activity which these dogs sometimes exhibit, especially younger dogs. Greyhounds are also famous for their luxurious stretching. “The girls enjoy plenty of ‘doga’, especially when they’re just waking up from a nap, which is often! They win the hearts of everyone that has the pleasure of meeting them. In case it isn’t obvious, we adore them,” said Brooke. Brooke said she loves knowing the two Greyhound girls are safe and happy. “By them being with us, it means there’s another space or two at the kennels for another dog to be rescued and have a chance at finding their ‘fur’ever home,” send Brooke. She first became aware Greyhounds need homes when she met a lady walking her Greyhound, named Macy (Grey). “I’d never seen a greyhound as a pet before. My knowledge of the breed was limited to what I’d seen on TV with racing. In my mind, the breed was boisterous and, potentially, aggressive. Macy was neither of these things,” said Brooke. Luke said the couple wanted to rescue a dog, but weren’t sure what breed would best suit their personalities and lifestyle. “Greyhounds ticked so many boxes. They are gentle and affectionate, don’t need a lot of exercise, don’t lose much hair, don’t have a ‘doggy smell’ and rarely bark. They sounded too good to be true, so we decided to foster two,” he said. 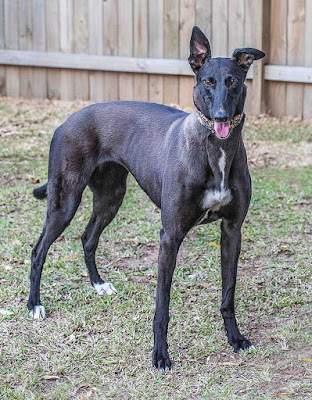 Brooke already had experience with greyhounds as a volunteer at Greyhound Rescue’s (GR) western Sydney kennels. “My first shift at GR was in December last year. Responsibilities include cleaning the kennels, feeding, walking and playing with the hounds. My favourite is showing the hounds lots of love and affection,” said Brooke. News that an adoption application for the girls had come in was met with mixed emotions. After some discussion, Brooke asked Luke what he thought they should do – let the girls go, or adopt them.“It was a no-brainer for me, they’re my girls,” said Luke.“We couldn’t bear to part with them,” said Brooke. Janet Flann, GR founder, said the charity pays the full cost of necessary vet bills incurred while a dog is in foster, while carers cover food, shelter and flea treatments. “We’ll supply muzzle, coat, collar and lead. Foster carers pay for food. We can help with costs if necessary. 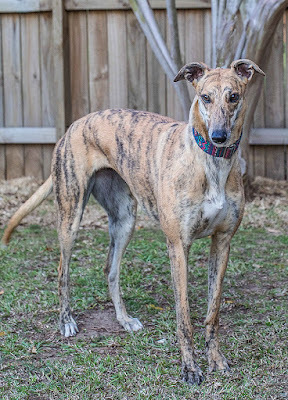 How long a hound stays depends on how many adoption applications we get, but carers should be prepared to keep a dog for at least six months,” she said. Peter said carers don’t need to worry about the type of dog they’ll get to foster: “We like to match foster carers with dogs, so we ensure compatibility with your household and other pets. Greyhounds are greyt! Thanks Dog Lovers for this story so others can have the joy of fostering. Well done and Merry Christmas.